Check out the BIG-T Telecaster (R) Neck Pickup!Bridge Pickup now available too! AnalogMan is the place to go for everything between your guitar and amp! 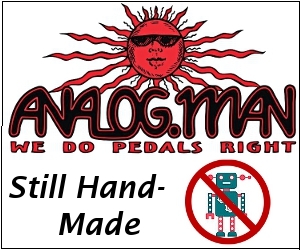 AnalogMan is not your normal pedal company. We don't like marketing or mass-production. We like to keep everything small and under control, and make things ourselves, built-to-order, to YOUR specs, with only the very best parts, many of which are no longer available. Most other companies our size now simply screw circuit boards that a factory assembles for them with robots into their cases, and calls them 'handmade'. We still make them completely by hand like Mike did 20 years ago when he started AnalogMan. We like to treat each customer as a prospective friend. We now have friends all over the world with the common interest of guitars and effects. No huge magazine ads - referrals are the best ads, and we get plenty of repeat business from our good customers. Once you get something from us, we will do our best to keep you coming back for more. Many players have bought almost every pedal we make (plus many more that we sell). We don't boast how great our service is, we prefer to let you tell us. Check the links at the top to find the products we sell. You may be directed to our original website http://www.analogman.com for some information. We will leave that website running for now, it has a lot of great information but this website makes ordering much easier. On this website you can order several items and options and it combines them for simple checkout and combined shipping. Actual USPS email rates are given to you after you check out, before you pay. NON USA ORDERS: You will probably have to use PayPal, as your bank probably does not have address verification (AVS). Sorry, we can not accept your credit card, but there is no way for us to tell if the card number was stolen. Please complain to your bank, tell them they should have verification so on line orders can be placed safely.